After European settlement began in the early 17th century, the land that is now Philadelphia was gradually cleared for farmland to provide food for the humans and livestock that lived here. As the city expanded, those farms were one by one sold off for residential and commercial development. The pace of development accelerated after the Civil War, when Philadelphia became one of the largest and most diversified manufacturing centers in the world and there was a great demand for housing for the influx of factory workers. A second housing boom occurred about 90 years later, when large areas of the city, in particular Northeast Philadelphia, were built up with houses for to accommodate returning World War II soldiers and their families. By the 1980s, all the commercial farms in Philadelphia were gone, and the loss of farmland continues in the surrounding suburbs. Urban farming is having a resurgence in the city today, and a great photographic and audio overview by Philadelphia photographer Dave Tavani can found here on his website. The largest farm in the city today is at Saul Agricultural High School, and smaller urban farms are also springing up, including Mill Creek Farm and Greensgrow Farm. The Pennsylvania Horticultural Society has long supported the growing of food in the city through its Philadelphia Green program. I apologize to serious historians of the city's more than 350 years of development and expansion for the above gross oversimplification, and welcome any input about further resources, which I would be glad to link here. Philadelphia farms need relief from bad weather and low prices. Farms in the city? Sure as shootin'! We have 310 of 'em - 15,000 acres valued at $11,000,000. But citified $35-a-week help is no good (Heh! Heh! Heh!) - Can't hoe worth shucks! The population of Philadelphia is more the than 2,000,000, and no one would suspect it of being at all agricultural or rural. Nevertheless, certain citizens of the 35th ward awake to the rooster's crow each morning and evening is heralded by the lowing herd. You can throw the alarm clock out of a bedroom window into a cornfield at 55th st. and Springfield av. Island road homes are almost all farm houses! All of which does not prove ours is a "hay-town," but just the same Philadelphia has its farmers. In fact, there are 310 farms inside the city limits, and they are not mere makeshift garden spots, either. According to Pennsylvania statistics, the combined value of all the farm property in the city is $11,672,648. More than 1,500 persons live on farms right in the city. "Where are they?" is your next question. All right, we shall tour the city for a few paragraphs and show you. First, up the Roosevelt boulevard. Turn left into Bustleton pike. To the right, ladies and gentlemen, is the farm of Ed FarrelI, a noted agriculturist, who raises everything you could possibly hope to get on a vegetable platter. To the left is the acreage of Harry Felton, and there is his father, eighty-three years old, but still able to work the "young fellers" into a hill of beans, pulling beets. We stop and broach the subject of crops to Mr. Felton, Sr., and he and his grandson, Wilbur stop to advise us that in Philadelphia this year, farm relief was certainly needed! "I've been a farming for nigh sixty years," said the older man, "and I've yet to see a season like 1929. First it was rain, rain, rain in the spring and we couldn't get the stuff planted. Summer came and with it a drought that killed the plants or shriveled them up so they're practically no good. Now that it's fall, it won't stop raining again. And when you do take something to market, it doesn't bring anything!" Mr. Felton digressed to the subject of hired help. There, friends, is a problem, even on a Philadelphia farm. "They want $38 a week and they can't do anything," said he, "Why, not a month ago a young feller came out here, and my son hired him, and told him to go down in the field and help me with the tomatoes. 'With the old boy?' he asked, and then said, 'That'll be easy.' But he learned different. He lasted a day and a half, trying to keep up to me, and I wasn't hurrying, mind. Then he got sick. I guess I hoed him in the ground. He didn't come back." Ten hours a day, but no daylight rising, is the schedule on a Philadelphia farm, in the 35th ward at least. Scattered about the Felton place, which is ten acres in extent, are farms of the Shallcross family, one owned Charley Ford, and that of the Fishers. Beets, carrots, lettuce, celery, spinach, radishes, string and lima beans, onions, rhubarb, peas, green corn, parsley, tomatoes -- these are the staples. Potatoes are not on the list. They don't grow well in this soil. Hay, grain, field corn and livestock find no place in most of the Philadelphia farmer's pursuits. There is one exception. Mrs. Elizabeth Fisher and her sons, Winfred and Frank, operate a seventy-acre farm on Castor road, near Roosevelt boulevard. They keep more than ninety cows, fine specimens of Holsteins, Jerseys and Guernseys among them. Milking machines, the latest in dairy equipment, and a fine team, are to be found here. Brewers' grain, salvaged from the manufacture of near beer, is fed to the horses and cattle. Fertilizer must be bought; the farmers use nitrate of soda, largely. There are many more farms in the Bustleton section and out the boulevard up in the Northeast as far as the city limits. But this section is not the only one raising food for Philadelphia. Along Island road and Tinicum av., southwest Philadelphia, the truck farmers abound. James S. Brooks, on Magazine lane, has twenty-five acres devoted to green stuff. He pronounced it a bad season but seemed to take the matter philosophically. "When the rain did come this fall it was too late and flooded the spinach out," he said. H. A. Hunter, who has farmed for twenty-three years within sight and hearing of the Philadelphia Airport, where the airplanes scare the chickens and horses, reports business bad. Rain, drought and low prices are his trouble, too. But he goes about planting pansy beds and combines this side line with his neatly kept truck farm and "makes out." His place is a beautiful spot in an expanse of oil tanks, marsh and lowlands. Gladiolas and scarlet sage brighten the yard, and of an evening he can lie back in the rustic seats back of his quaint little house and listen to the thrum of airplane motors nearby, or watch the veering wind as it whips a "wind sock" that a flying friend installed on his barn. Heh! Heh! This is the Life! A pleasant, rural life for one situated in one of the oldest parts of the country's third largest city. But for real country dwellings, consider that of B.F. Robinson, 55th St. and Springfield av. Surrounded by flowers, by greenhouses, and by an entire city block, here is the "last of the Mohicans" as regards West Philadelphia farmers. On all sides the row houses that have sprung up hedge this lot in. The lot itself is occupied by the William K. Harris greenhouses, of which Robinson is manager. But real estate men cannot afford to take over the business, and so the one garden spot of this size is left. Farming is no joke in Philadelphia. Why, there are 15,000 acres of farm land right in the city limits, and the city farmers "know their onions," too. State statistics show that Philadelphia county (which is the same geographically as the city of Philadelphia)) exceeds the State's average yield per acre of many farm field crops. Yes, siree! See original article and photographs here. Caption 1: Otto Kaufmann fills in some time hand-shelling corn. like many Philadelphia farmers, he and his brother have sold their ground. rise unexpectedly behind the field, with Budd plant in the far background. Up in the northeast corner of Philadelphia not far from the humming traffic on Roosevelt Boulevard, is a long, weathered farm shed. In one of its sections, late last winter, an ancient pot-bellied stove glowed red. Beside it, Otto Kaufmann shelled ear corn into a basket by hand, while unintimidated sparrows flew over his head or twittered in the cob-webbed beams. The shed and its occupant, in a sense, are typical of Philadelphia's few remaining agricultural islands. Surrounded by a steadily widening urban sea of homes and industries, these farms within the city preserve much of the past, adapt themselves to the present, and are very uncertain about the future. The inside of Kaufmann's shed might have looked the same a century ago. Outside, a tractor and truck represent the present. The future can only be represented by a big question mark. Otto Kaufmann and his brother, William, have been on this 50-acre farm for some 60 years. The Haist family next door has held its 42-acre farm since 1900. Elsewhere on Philadelphia's fringes are similar private, working farmers with long records of, ownership. Yet practically none of them knows where he'll be living a year or two from now. The reason for this is simple: farming in the city is too expensive. Nick Kobel, who farms 60 acres east of the Boulevard, points out that some of his land is taxed at $50 an acre. "You can't make money farming at that rate," he says, "especially with everything else up. When I started farming, lime cost $8 a ton; now it's $18. Fertilizer used to cost $25; now it's $50. Altogether, counting labor and materials, my farm expenses used to run $2000 a year. Now they run about $10,000 a year . . . Sure, I get more for my products, but I don't get that much more." Frank Fisher, who has a 96-acre dairy farm near the Red Lion plant of the Budd Company, says he has to work seven days a week to make money. He has been on his present farm for 13 years, and runs it with obvious efficiency, Earlier, he owned a farm nearer the center of the city, which cost him $12,000 a year in taxes. "You can't farm profitably in the city," he says. "You can only keep going until you get a reasonable offer for your land. My last farm was assessed at almost half a million. You can't make a dairy farm pay at that rate. On the other hand, you can't afford to take a low offer for your land, because you'll have to buy a similar property somewhere outside the city to stay in business." Next door to the Fisher farm with its vast barn, 120 head of cattle, and shiningly modern home, is a smaller, older place, the 40-acre farm of Paul Gossler. There, in an old stone barn, are two horses and two cows. Chickens cluck contentedly in the barnyard; kittens appear and disappear. Arched trees shade the nearby farm house. It could be anywhere far out in the country--until you look behind the barn. Then you would see, perhaps 50 yards from the barnyard, the edge of the urban sea. Neat rows of new homes rise unexpectedly beyond the field; behind them are the buildings of Budd's Red Lion plant. "You can't make money farming here," Paul Gossler, Jr., explains, waving toward the new homes. "When they develop the area, your assessment goes up. We raise truck here, and it just won't pay for the rising taxes . . . Well have to sell." Back in the weathered shed where the sparrows come for warmth, William Kaufmann echoes this statement. "Sure, we've had offers, but they just wanted to buy parts of the land for building lots. We'll wait. The farm diagonally across the road was just sold. They're moving closer . . ."
Curiously, in the face of a very uncertain farming future, most of the remaining farmers have their sons working with them. William Kaufmann's son is on the farm. Matthew A. Haist, the grandson of the original owner, now runs the Haist farm. Nick Kobel's son works with him, as do Frank Fisher's son and Paul Gossler's son. The Kaufmanns, who have a stall in the market at 18th St. and Ridge ave., raise mostly truck and corn. Matthew Haist, next door, also raises truck: spinach, beets, carrots, parsnips, rhubarb. He also plants corn and wheat and, like the Kaufmanns, raises pansies for the early summer trade. The Haists keep a horse for cultivating plots where the tractor is unsuitable, a cow for family use, and the usual chickens. A mile or two away, on Decatur road to the east of the boulevard, is the home farm of the Morrow brothers, William J. and Albert T. Here is the typical picture farm, complete with stream and tree-lined drive, a vast barn, a lovely old home, and sheep in the pasture. Albert Morrow was born here; William came to the farm at the age of 2, and both are well into their sixties. Yet they now have joined a long list of Philadelphia farmers and sold their ground. Currently the property of the city for use in expanding the Northeast Airport, the farm's continued life depends on the nature and extent of this expansion. Eventually the house and barn may be torn down, the stream filled in, the pasture leveled. "We're still living here with our sister," the Morrow brothers explain, "but we don't know how long it will be our home. It all depends on how the city uses the property." 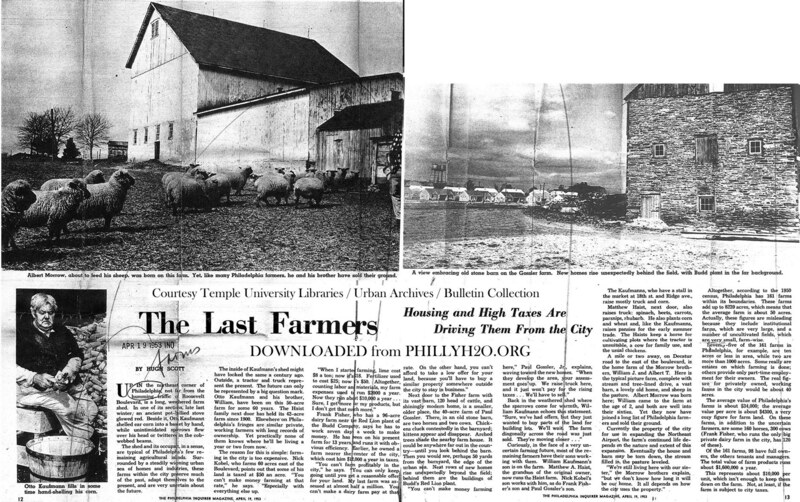 Altogether, according to the 1950 census, Philadelphia has 161 farms within its boundaries. These farms add up to 8239 acres, which means that the average farm is about 50 acres. Actually, these figures are misleading because they include institutional farms, which are very large, and a number of uncultivated fields, which are very small, farm-wise. Seventy-five of the 161 farms in Philadelphia, for example, are ten acres or less in area, while two are more than 1000 acres. Some really are estates on which farming is done; others provide only part-time employment for their owners. The real figure for privately owned, working farms in the city would be about 40 acres. The average value of Philadelphia's farms is about $34,000; the average value per acre is about $4,300, a very cozy figure for farm land. On these farms, in addition to the uncertain farmers, are some 160 horses, 300 cows (Frank Fisher, who runs the only big private dairy farm in the city, has 120 of these). Of the 161 farms, 98 have full owners, the others tenants and managers. The total value of farm products runs about $1,600,000 a year. This represents about $10,000 per unit, which isn't enough to keep them down on the farm. Not, at least, if the farm is subject to city taxes. The Census Bureau has finally decided Philadelphia is not a farming town. It will send only two enumerators here to take the 1959 Agricultural Census this fall. At the rate city farms have been disappearing in past years, there can't be many left. There were 161 in 1950 and only 76 in 1954. However, the 76 farms in 1954 had an average individual value of $96,286. This was higher than the average farm value in any of the other 66 Pennsylvania counties. The value per farm in 1950 was $33,596 and in 1945 it was $26,933. Obviously city farms are more valuable because of the higher land rates. With the advice and consent Senator Hugh D. Scott, Jr., Republican State Chairman George I. Bloom and the 14 Republican congressmen, he has selected three field supervisors. They are Leroy W. Bowers, the 1st to 15th and 19th Congressional districts; Howard W. Lindaman, Altoona, 16th. 17th and 18th congressional districts, and Frank X. Roche, of Pittsburgh, 21st through 30th congressional districts. The state will employee a total of 61 new leaders and 910 enumerators. Allentown area will have 22 leaders and 339 enumerators. Altoona area will have 19 leaders and 266 enumerators. There will be 20 crew leaders and 305 enumerators assigned to the Pittsburgh area. The Agriculture Census will provide about $309,000 worth of employment in the state. A field assistant will work about four months and make about $1,966, a crew leader about 51 days and make $795, and an enumerator about 20 days and make $278. For generations their families tilled and cultivated the rich but steadily dwindling soil of William Penn's long-ago Greene Countrie Towne -- farmers within the city. After World War II, the city grew and farm acreage skyrocketed to values never dreamed of before. Miles and miles of homes, apartment, shopping centers rose on what had been farmlands. By the latter 1960s prices had escalated to $20,000 an acre and higher for some tracts. About 10,000 acres changed hands for an overall estimated $100,000,000. Much of the profit was pocketed by investors and speculators. Today not a single commercial farm is operated within the city limits, according to William White, Philadelphia County farm agent. Many former city farmers now have larger spreads than when they farmed within the city limits. And some of them are being hemmed in once again by housing and commercial construction. The Speccas -- Romeo, 79, and his son, David - farmed a 60-acre tract along Byberry road, near the present Liberty Bell Race Track. When they sold the spread in the 1950s, acreage in the Far Northeast cost between $3,000 and $5,000 an acre. The Speccas moved to rural Springfield Township, Burlington County, N.J. and purchased a 103-acre farm on the Jacksonville-Mt. Holly road, when land in the area cost about $1,200 an acre. Since then they have added another 200 acres. Land there is now bringing about $3,000 an acre. Specca is semi-retired. David Specca and his wife, Anne, say the family has no intention of being uprooted a second time. "We're here to stay," said Mrs. Specca. "One move in a lifetime is plenty for a farm family." The construction crews are still some distance from the Specca lands, but area farmers report land speculators and investors already are plying the area. Nicholas Kobel, 82, who farmed 60 acres on Red Lion road for nearly 50 years, is one of the minority who didn't continue farming elsewhere. Kobel lives in a modern ranch style house on Welsh road. He worked in an industrial plant until he retired. The going price for land was about $3,000 an acre at, the time -- which he didn't receive, he said, because the city purchased his farm through eminent domain proceedings. Some farmers changed from general produce farming to flower and sod farming after they resettled. Matthew A. Haist, 49, operates a thriving 18-acre flower farm in Ivyland, Bucks County. Generations of Haists , worked the family farm near the present-day Woodhaven road. Farmland was held at about $5,000 an acre when the Haist farm was sold to make way for highway projects. 'Mums are sprouting up on the Haist farm. Pansies have been planted for spring delivery to the commercial trade. Haist's meticulously maintained greenhouses are already ablaze with myriads of colors of perennials. "I find operating a flower farm has eased my help problem s considerably," said Haist, whose wife and two children, Margo, 17, and Randall, help him with the farm chores. He says his financial returns equal those he netted from produce farming. Maybe better. Construction crews come ever closer to his farm, "but not too close yet," and he is staying put, Haist said. "We have no intention as of now of ever moving again. One move made us tired of it," he said. The Morrow brothers, Albert T. and William J. who operated a large farm at Red Lion and Decatur roads now live in Langhorne Manor, Bucks County. They farmed the tract under a rental agreement after the city purchased it for planned expansion of the Northeast Airport. They own a tract of land near the thoroughbred race track now under construction in Bensalem Township. Land prices in the track area are bringing up to $40,000 an acre, a realtor said. Albert Morrow declined comment on the brother's plans for this tract. He said his brother owns a 73-acre farm in Bucks County which returned an excellent hay crop. "Just say everything has turned out all right for us," Albert said, "Not living on the farm anymore you get the feeling sometimes of living close. And I think 1 have talked enough." The Rowland Comly family changed over to sod farming when they sold their 60-acre farm and resettled in Wycombe, Bucks County. Mrs. Comly, now a widow, said the city called their fertile farm a "wasteland" when they took it under eminent domain and paid between $500 and $1,000 an acre for the tract. Mrs. Comly said the land eventually was sold and resold, finally bringing a price of about $20,000 an acre. The farm is now supervised by the widow of Mrs. Comly's son, Newton. "It's worked out very well. In life I guess everything eventually evens up," Mrs. Comly said. For 52 years, Edward Fleming, 70, farmed land on which the Woodhaven Mall now stands. When the state purchased the Fleming tract for highway projects ground in the area was fetching $5,000 to $6,000 an are. Fleming and his two sons, Edward, Jr. and David now farm 185 cares in Newtown Township, Buck County. "We got a bigger mortgage now. Expenses are up, but all in all we are doing all right," said the elder Fleming. Joseph Dirigilamo and his two sons, Joseph, Jr. and Eugene operated a 25-acre truck farm by the Delaware river. They sold in 1969 for about $20,000 an acre. The tract was later resold for a reported $50,000 an acre. The Dirigilamos purchased a 20-acre farm at Cornwells Heights, bucks County, when land there was bring $7,000 an acre. "We continued on with truck farming," said Eugene Dirigilamo. "It's worked out good," he said. The family also operates a roadside farm stand. Four years later their farm is once more nearly hemmed in by new building projects. 'We're not selling and moving again," Eugene Dirigilamo said. "Once is enough. We're truck farmers. We're not in the land selling business." Unimproved ground in the area is bringing $15,000 to $18,000 an acre range; improved tracts at about $28,000 an acre, according to area realtors. Philadelphia's last major farmer is an endangered species. Harold Lovett is the peregrine falcon of Philadelphia; a snail darter; a bald eagle. Lovett is an endangered species. Lovett is a farmer - apparently the only major farmer left in Philadelphia. William White, the U.S. Department of Agriculture county agent for Philadelphia, said he knows of no other farmer in the city. Spokesmen for the Philadelphia Planning Commission, which does not zone for farm protection and lists no farmers by name, said Lovett's fields are probably the last farmland in the city. The Census Bureau, which listed as many as 45 working farms within the city in 1966 and as few as 12 in 1974, said that its last census in 1978 listed so few farms, less than 10, that federal law forbids giving a precise number for fear confidential information can be deduced from the figures. Lovett, who has been farming since he got out of the Army in 1955, said he knows of no other major farmer in Philadelphia. He listed three others who work some farmland within the city, and one of them lives in Bucks County. The only Philadelphian he knows to be a farmer plants no more than a dozen acres. Lovett's homestead is not typical of a farmer. You drive 19.4 miles from center city just shy of the city line with Bucks County and you're still smothered by the asphalt and concrete. He lives on a sliver of land off Bustleton ave; near Red Lion road, wedged between year-old condominiums and an abandoned shopping center. Lovett said he survives as a farmer only because he owns virtually no farmland. He rents most of his acreage from the city and the state, the city land in patches around North Philadelphia Airport, the state land in several separate fields around the State Hospital at Byberry. But Lovett's farm is no small pickings. His Philadelphia land amounts to about 340 acres. He works three places in Bucks County, 73 acres in Newtown Township, 20 acres in Richboro and another 30 acres in Bensalem. All are rented. He said business is good. He brought 636 bushels of wheat into the grain elevator at the Delaware River end of Allegheny Ave. last Wednesday, making what he considered a healthy profit. But one afternoon last week, like a peregrine falcon soaring over disappearing marshland, Lovett drove along Red Lion road, down across Roosevelt blvd., pointing to where farm after farm has disappeared in his lifetime. He showed where all that's growing is dead: the bricks and mortar of row houses and apartments. He said some of, the folks who have moved in there are killing his farming. "White trash,'' he said. "Animals." Lovett, with his long-time partner Tom Schrey, owns Bustleton Landscaping Co., and within that Bustleton Sod Farms Inc. For every year that he'll cut up a field into squares of topsoil and sell them for sod, he'll let a field grow for a year in soybeans or wheat to give strength back to the soil so it can grow thick sod again. The "white trash" don't bother his beans or wheat, he said, but they kill his sod. They run four-wheel-drive vehicles and motorbikes into his fields and whip them around in circles, chewing up the sod. As Lovett stood in a field as smooth as a golf course off Southampton road, east of Roosevelt blvd., he pointed to the scars made by the vehicles where only weeds grow now. "I've caught guys in this field. We've caught quite a few. This one," he said, pointing to a thick outcropping of weeds, "got caught and stuck." So Lovett has dug trenches around his fields, shoveling high mounds of dirt between the road and trenches to discourage the vandals. Another problem is beer bottles. His men must waste a day gathering glass before they can cut the sod. It's beautiful land that Lovett farms around the Pennsylvania National Guard armory on Roosevelt blvd. just below the city line at Poquessing Creek; east of the boulevard near empty Byberry buildings; and on the west side of the boulevard where Byberry is still in use. But Lovett is bitter. He's bitter not only towards the state, which he said refuses to police its own grounds and so allows the destruction of his fields, but against the city, which he said knows so little about preservation that it has polluted its own land. As he drove off Comly road, onto a fallow field at the north edge of North Philadelphia Airport, he described the land. "This was called the Bonner Farm; one of the best farms up here," he said. "The city owns it now; airport ground for expansion. They took this and used it for dumping sewage sludge. We're trying to bring it back (to life). It can't give you any edible crops any more. The sludge is high in metals; comes out of the lagoon down in Tioga. That's high industrial waste in here. We'll grow a crop (of soybeans) and plow it under, and then; we'll try to grow grass (for sod sales). "The city took this farm ruined it," he said. As he drove through [the Far] Northeast, Lovett pointed to [?] other farms have disappeared. However, there are a few left. He mentioned Ed Bloomfield, a Bucks County resident who farms 60 acres of Byberry land; and John Wiley, who farms about five acres around his home at Verree road and Solly Ave. and another eight acres on the edge of Pennypack Park; and his old friend Paul Garr, who farms three acres near Worthington road, north of Byberry road. So why does Lovett put up with the problem and stay in the city to farm? He said it's the availability of the land he rents and because he's near the markets, the grain elevators for his soy and wheat, and the folks in the Far Northeast who buy his sod. But even that can't last, he said. "Within 10 years," Lovett said, "we'll be gone, too."